Item 5.03 Material Modification to Rights of Security Holders. On April 11, 2019, FitLife Brands, Inc. (the “Company”) filed two Certificates of Change with the Secretary or State of the State of Nevada, copies of which are attached hereto as Exhibit 3.1, the first to effect a reverse stock split of both the Company’s issued and outstanding and authorized common stock, par value $0.01 per share (“Common Stock”), at a ratio of 1-for-8,000 (the “Reverse Split”), and the second to effect a forward stock split of both the Company’s issued and outstanding and authorized Common Stock at a ratio of 800-for-1 (the “Forward Split,” and together with the Reverse Split, the “Reverse/Forward Split”). The Reverse/Forward Split will become effective on Tuesday, April 16, 2019 on or about 12:01 a.m. PST. to Section 78.02 of the Nevada Revised Statutes, the Reverse/Forward Split does not require the prior approval of the Company’s stockholders, and requires only the approval by the Company’s Board of Directors, which was obtained on March 25, 2019. 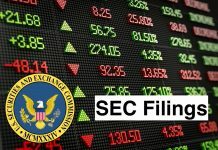 Effective April 16, 2019, the shares of Common Stock will begin trading on the OTC:PINK marketplace on a post-Reverse/Forward Split basis under the ticker symbol “FTLFD.” The “D” will appear on the Company’s ticker symbol for the 20 business days following the effective date. Beginning on the effective date, the Company’s new CUSIP number will be 33817P207. Holders of fewer than 8,000 shares of the Common Stock immediately prior to the Reverse/Forward Split will be entitled to receive cash in lieu of fractional shares based on the 5-day volume weighted average price of the Company’s Common Stock immediately prior to the Reverse/Forward Split. As a result, such holders will cease to be stockholders of the Company. Holders of more than 8,000 shares of Common Stock immediately prior to the Reverse/Forward Split will not receive fractional shares, and instead any fractional shares resulting from the Reverse/Forward Split will be rounded up to the next whole share. The Company’s transfer agent, Colonial Stock Transfer, will be sending holders of record of the Company’s Common Stock a letter of transmittal with further details of the Reverse/Forward Split and instructions setting forth how stockholders may receive updated Common Stock certificates and/or cash in lieu of fractional shares promptly after the effective date. As a result of the Reverse/Forward Split, the number of shares of Company Common Stock authorized for issuance under the Company’s Articles of Incorporation, as amended, will be 15,000,000 shares. Item 5.03 Amendment to Articles of Incorporation or Bylaws; Change in Fiscal Year. FitLife Brands, Inc. is a provider of nutritional supplements for health conscious consumers marketed under the brand names, such as NDS Nutrition Products (NDS) (www.ndsnutrition.com), PMD (www.pmdsports.com), SirenLabs (www.sirenlabs.com), CoreActive (www.coreactivenutrition.com) and Metis Nutrition (www.metisnutrition.com) (together, NDS Products). The Company’s product portfolio also includes brands, including iSatori (www.isatori.com), CT Fletcher, BioGenetic Laboratories, and Energize (together, iSatori Products). The NDS Products are distributed principally through franchised General Nutrition Centers, Inc. (GNC) stores located both domestically and internationally, and, with the addition of Metis Nutrition, through corporate GNC stores in the United States. The iSatori Products are sold through approximately 25,000 retail locations, which include specialty, mass and online. Its iSatori Products are sold through iSatori, Inc., which is a subsidiary of the Company.